Higher Ed Institutions are often judged by their retention rates and the problem of increasing student attrition rates seems to be getting worse every year. The onus is on the decision makers at colleges and universities, to prove their worth by helping their students succeed. Our student population is very diverse in age, demographics, race, and gender. Some students need help in scholarships; others need help with study, work balance, and family. Therefore, we need several strategies that could address all of those needs. 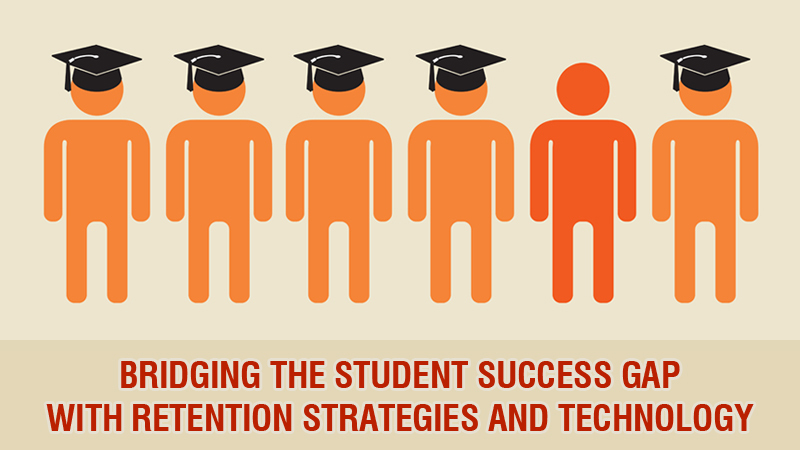 Fortunately, there are a number of novel approaches to student retention that are helping keep students enrolled and on a path toward a degree, including better analytics, improved use of mobile devices, video conferencing, and student information portals. We have identified few successful strategies that might work well with the students of all strata. Below listed are few practices that focus on the entire student population as well as specific groups. Some of these solutions are old-fashioned interventions, but many of the most effective approaches take advantage of technology in new and interesting ways. Here is where the technology comes in. Smart education professionals are embracing the mobile trend, realizing that for many students, their primary computing access may well be through a mobile device. When educators create mobile-friendly student experience, students gain greater flexibility in how, when, and where they can work. Incorporating mobile can even be one effective way to increase engagement, and student engagement has clear positive implications for retention. We have developed student retention and advising management solution e2s Retain, a Success CRM tool that identifies at-risk students in need of timely support and allows appropriate staff to efficiently collaborate on resolutions. We can track everything from attendance to grades and because it is interconnected to all departments across campus, faculty, and staff, they can monitor the progress of any student. The system allows you to send automated alerts to the student and to the faculty to intervene, if necessary. Engage2Serve is a cloud-based Student Lifecycle CRM designed to help colleges recruit prospects, retain students, and engage alumni. Colleges and universities can leverage the power of mobile technology using the Engage2Serve mobile apps. Please click here, to learn more about Engage2Serve’s mobility solutions and how they can help meet your institutional or program goals.